Great Neck Water Pollution Control District Awarded Grant by the Nassau County Community Revitalization Program. GNWPCD Chairperson Jerry Landsberg, GNWPCD Commissioner Deena Lesser, Nassau County Legislator Ellen Birnbaum and GNWPCD Commissioner Steve Reiter stand outside the entryway to the District. Legislator Birnbaum recently secured $50,000 from the Nassau County Community Revitalization Program to assist the GNWPCD as it pursues construction projects to be ADA compliant. Great Neck, NY - February 18th, 2016 - The Great Neck Water Pollution Control District (GNWPCD) recently announced the District was awarded a grant of $50,000 from the Nassau County Community Revitalization Program. The grant is to pursue construction projects enabling the District’s administration building at 236 East Shore Road to be ADA compliant. “The District would like to thank the Nassau County Community Revitalization Program and Legislator Ellen Birnbaum for working to secure this grant on behalf of District residents,” said Great Neck Water Pollution Control District Commissioner Deena Lesser. The grant will fund the reconstruction to the District’s administration building, including the addition of a concrete ramp to make the building handicap accessible. In addition to the ramp, the grant will also help fund construction on the building entryway, doors and sidewalks to ensure ADA compliance. 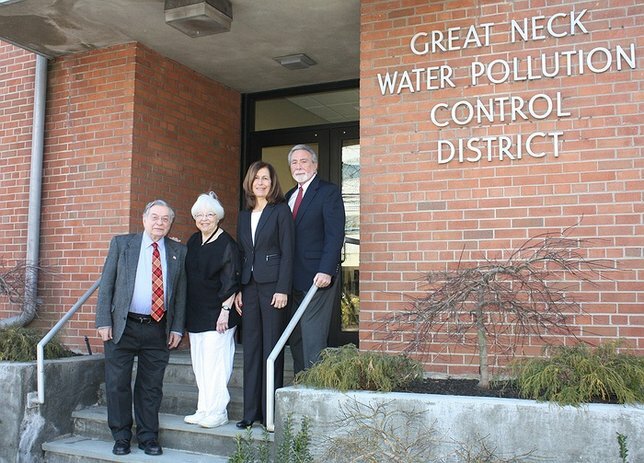 The Great Neck Water Pollution Control District (GNWPCD) is a commissioner-run Special Improvement District within the Town of North Hempstead. The GNWPCD has provided sewage services for the Great Neck area since 1914, and currently serves more than 25,000 residents and businesses in the villages of Great Neck, Saddle Rock, Kensington, and those parts of Thomaston and Great Neck Plaza east of Middle Neck Road; as well as all unincorporated areas north of the Long Island Rail Road and a part of Manhasset. The GNWPCD's mission is to protect our bay, the environment and the health of our society. Subject: LongIsland.com - Your Name sent you Article details of "Great Neck Sewer District Pursues ADA Compliance with $50,000 Grant"